Will Recent Foreclosure News Affect Washington State Real Estate? Is your head spinning with questions about foreclosures? I’ve had three clients ask me how the foreclosure process will affect real estate sales in Washington State. I’m not sure anyone can answer that question completely right now. This week I heard an NPR news story about mortgage backed securities now asking banks take back certain loans. I’m not going to attempt to answer all of the questions about foreclosures, since as I’ve said, I don’t believe anyone knows how this will all shake out. However, I am going to talk about what’s happening in Washington State. Attorney General Rob McKenna made a statement as to what his office is doing regarding the foreclosure questions. The focus of Atty General McKenna’s communication to trustees and servicers is directed at pending and future foreclosures. ….it is important to understand that buyers who have already closed the purchase of a home with title insurance, even if the home was foreclosed, are not at risk. The AG’s announcement does not undermine those buyers who purchased property and insured title. There is no reason to assume there were defects in a foreclosure process that is already concluded, but if a defect were revealed, the buyer will be protected by buyer’s title insurance. Similarly, the Attorney General is not asking lenders with REO properties listed for sale or pending closing to stop the sale of those properties. Properties that have already been foreclosed are not affected by the Attorney General’s announcement. There is no reason to believe, based on these announcements, that already-foreclosed properties cannot be sold with clear and insurable title. All Washington homeowners and REALTORS will benefit from a directive requiring lenders to adhere to Washington law during the foreclosure process. As we (The Washington Association of Realtors) have stated repeatedly in the last two weeks, there is nothing fundamentally broken in Washington’s foreclosure law. To the contrary, the law is good and the Attorney General is insuring that it is obeyed by foreclosing lenders. Regardless, the foreclosure news puts some fear back into the real estate marketplace. It’s more fear of the unknown here that seems to be the issue. If it were more clear as to how this will impact real estate, it would help to calm the fear of the unknown, which seems to rule right now. So, in answer to my question that’s the title of this post, I can’t give a definitive answer yet. This news, coupled with the time of year, and the upcoming election, are all issues impacting the real estate market and contributing to home buyers moving more slowly. What do you think about the latest wrinkle in real estate with the foreclosure question? 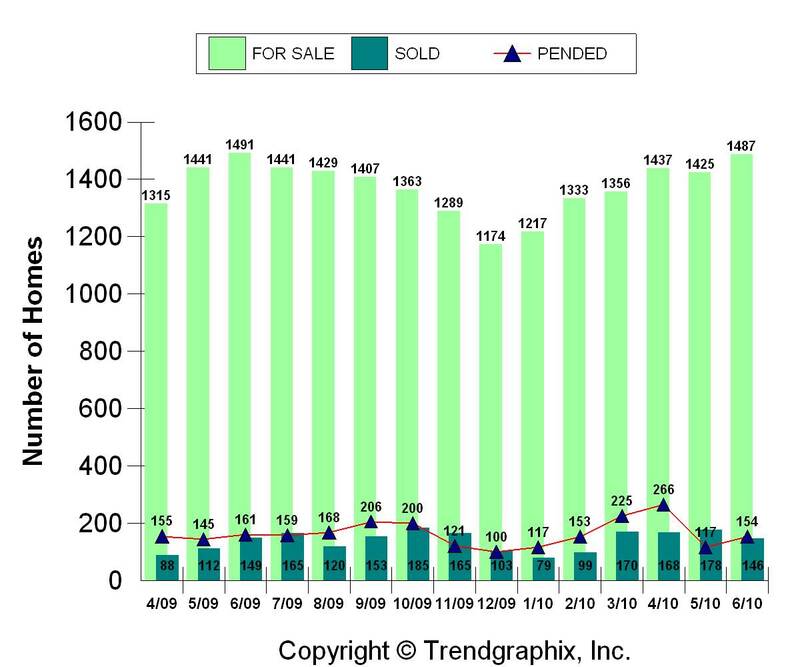 What Were The Odds of Selling Your Seattle-Eastside Condo in June, 2010? June, 2010 1487 condos for sale 154 condos sold 10 % odds of selling. June, 2009 1491 condos for sale 161 condos sold, 11% odds of selling. *Adjusted from previous month’s original numbers to reflect the actual number of condos sold and closed. Some of the sales originally reported last month failed and did not close. Some of the reasons sales fail are the buyer and seller don’t agree on the building inspection, the condo does not appraise for the sales price or the buyer’s financing does not come through. In this month’s post I’ve included the condo real estate statistics for April to show the sharp contrast with May and June of this year. Seattle-eastside condo sales dropped like a stone from the high of 281 in April to 117 in May and 154 in June. We’re seeing a lull in Seattle area condo sales, which is partly seasonal as people are out playing in the sunny weather. But have condo buyers forgotten there are still good deals after the tax credit? Don’t forget, there’s a huge number of condos available on Seattle’s eastside as we’re at the high point in Seattle-eastside condos for sale so far this year. There are some great choices out there. Plus, the added bonus is interest rates are at a 30 year low. For a picture of King County sales, check out The Seattle Times. I remember when I bought my first home in the mid 1980’s. I was so excited, the interest rate was at the bottom of the double digits, considering what the early 80’s had to offer with rates in the high teens. I had friends who purchased in Brooklyn, NY in the early 80’s and were paying almost 17% for their mortgage. The interest rate for my first home was just above 10%. Granted the home prices were significantly less, but the monthly payments were high, considering the lower prices of the times. 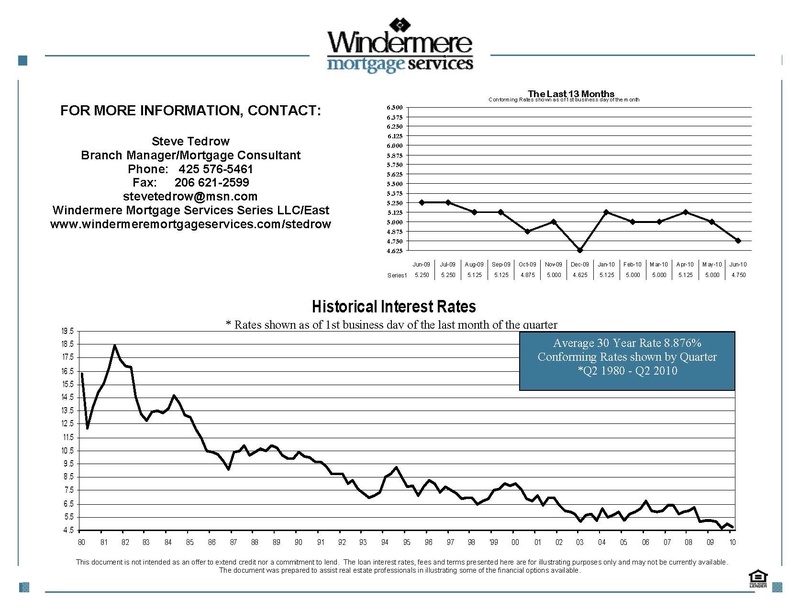 Fast forward to 2010, with interest rates the lowest in 30 years and prices at 2005 levels. 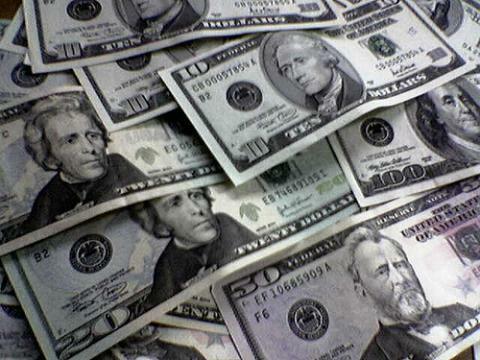 What’s the difference in monthly payments with the more recent interest rates we’ve seen? If you decide to purchase a $400,000 home, this is the difference in principle and interest payments over the last couple of years. Seattle-eastside home values have dropped significantly since the peak in the real estate market in the summer of 2007 and rates have also dropped as well. If you were to purchase a $400,000 home now, the payment would be approximately $300 less than two years ago, plus the home prices are also lower. In King County, WA, the choices are terrific because the number of homes for sale is just below the high so far for the year. 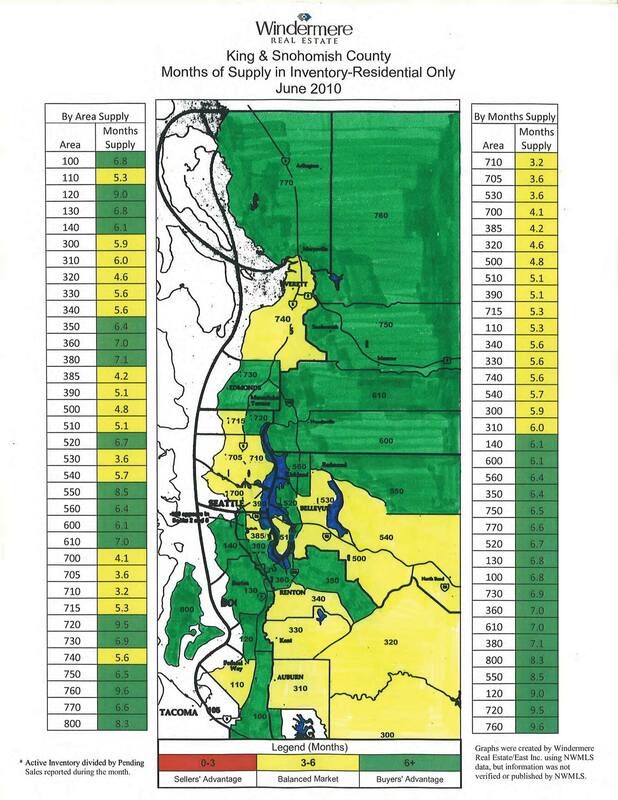 Right now, in King County, there are 13,921 homes for sale. So is it the right time to buy a home? You decide. During May “green” crept back into a number of Seattle areas. One large area on the eastside, Woodinville, Bothell, Kenmore, Duvall, and north Kirkland was “green,” back as a buyer’s market. April was the first month in a very long time in which there was no ” green,” no buyers’ markets in almost all the Seattle-eastside areas. In April, the Seattle area real estate market was the strongest in years. This is most likely a direct result of the 2010 tax credit. Both buyers and sellers were rushing to buy and sell before the expiration of the credit. May represented a lull in the Seattle real estate market. Was this a temporary lull or our new normal? The next several months will be good indicators, although summer tends to be a slower time every year in Seattle real estate. Home buyers and sellers are like everyone else. Seattleites play outside in summer. Of course, that’s providing the sun ever comes out this year! The good real estate news is there are still great homes and condos out there to buy and interest rates are at historic lows. The loss of the tax credit may not make much of a difference when calculating the savings in monthly payments over time. It may be the fall before we can determine the true pace of Seattle real estate. I’ll keep you posted. Green means it’s a buyers’ market. 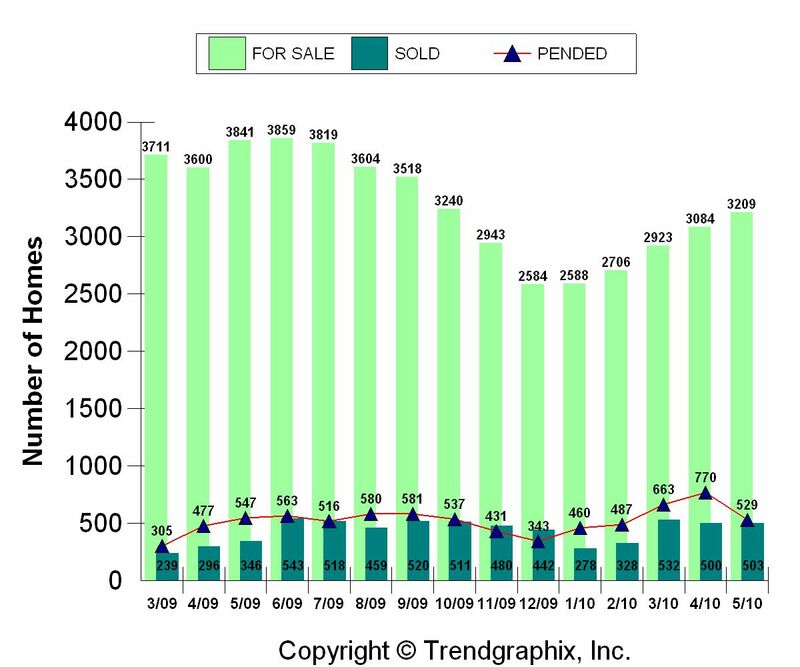 What Were The Odds of Selling Your Seattle-Eastside Home in May, 2010? The odds of selling a home on the Eastside in May, 2010 ranged from a low of 12% to a high of 20%, with an average 16.5% absorption rate. Contrast this with April, 2010 odds with a low of 20% to a high of 35%, averaging a 27% absorption rate. May’s numbers look more like May of last year than they do of April of this year. 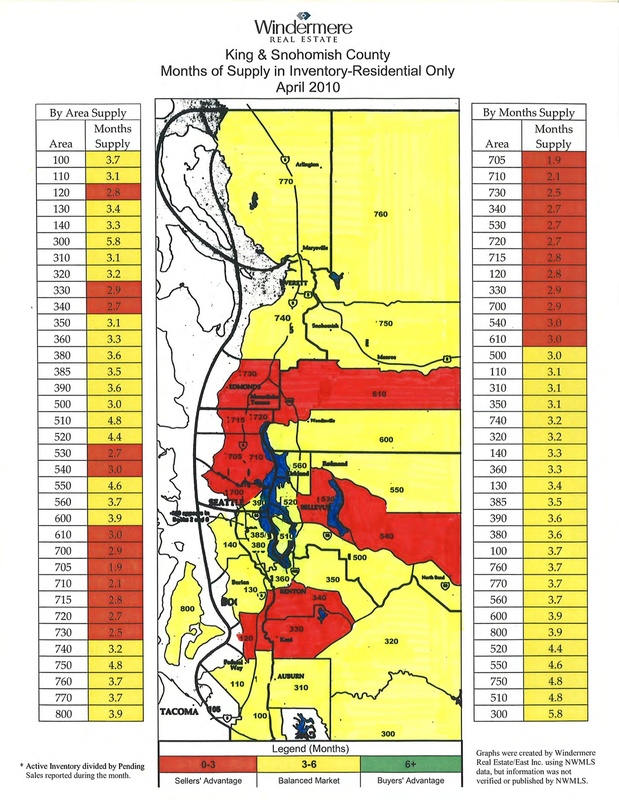 This month may mark the back to reality of Seattle-eastside real estate or maybe not. We’ll need to see how the rest of the year plays out as so many people rushed to buy and sell before the end of the tax credit. There are still buyers who want to buy and the sellers who need to sell, although this may be a time of adjustment. May, 2010 3209 homes for sale 529 homes sold 16.5% odds of selling. May, 2009 3841 homes for sale 547 homes sold 14% odds of selling. We are back to reality with Seattle-Eastside home sales. The tax stimulus pushed both home buyers and sellers to act more quickly this year, so the high number of home sales in April may have contributed to the drop in number of eastside home sales in May. The end of the tax stimulus had a greater impact on lower priced homes compared to higher priced homes. The average list price of properties that are pending went from $512,060 to $646,545. This is an unprecedented change month to month. As of this past week, there are 13,615 King County homes (houses and condos) for sale. The median price was down by .9%, an insignificant drop. Home sales on Seattle’s Eastside: down 7% The first down month in 2010. Best odds of selling: Sammamish plateau areas of Sammamish, Issaquah, North Bend, and Fall City with the best odds of selling as 20.5% of the Sammamish homes got offers. Worst odds of selling: Woodinville, Bothell, Kenmore, Duvall, and North Kirkland with 12% of the homes getting accepted offers. Biggest increase in sales from last year: A small 6% increase in Sammamish home sales was the highest increase in Seattle-eastside real estate sales. Quite a contrast to the double and triple digit increases we’ve seen the last few months. 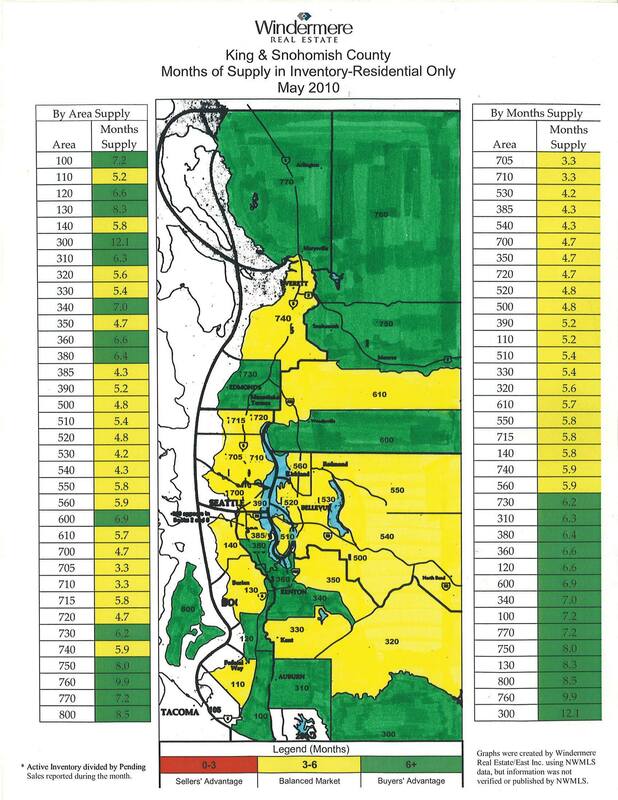 As an example, there was 102% increase in the number of Kirkland homes sold in April, 2010 when compared to April, 2009. Decline in real estate sales from last year: There was a decline in 5 out of the 7 Seattle-eastside areas, unlike the last few months when every eastside neighborhood experienced an increase in home sales. Redmond and Carnation had the largest decline in home sales with an 18% decline in the number of homes sold. The number of eastside homes for sale now: 3209 homes. Seattle Eastside real estate tends to slow down a bit when the sun comes out, which hopefully is any day now! The number of home sales could remain on the lower side in the near future for two reasons. One is the slow down after the tax credit rush which we are now seeing and the upcoming (think positively) sunny weather and summer vacations. People in Seattle like to play outside in the sun. There are a number of people who are “gearing up” to make a move, so we may see stronger eastside real estate sales when summer comes to an end. Ironically, when people ask me when is the best time time to sell a home, I tell them spring and fall are usually the best times. However, homes sell each month and the ones that show the best and are priced competitively will be the ones to get the offer. As of late last month, businesses that repair or renovate older buildings—specifically homes, schools and daycare centers built before the federal government banned the use of lead-based paint in housing in 1978—are required by the U.S. Environmental Protection Agency to adhere to strict lead-safe work practices. To comply with the new regulation, those working on older sites will need to invest in lead-testing kits, plastic sheeting, respirators, protective clothing and other lead-safety materials. This also is straight from the EPA website. 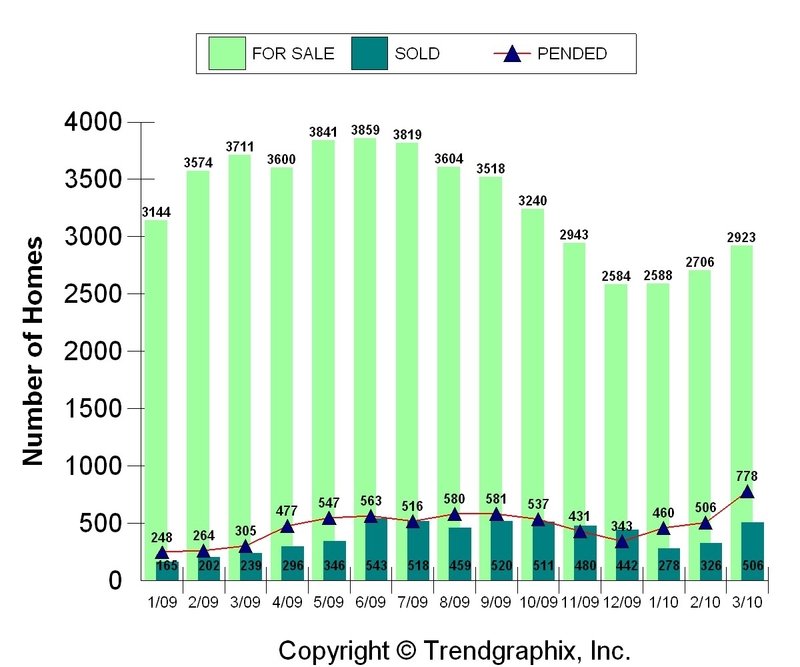 What Were The Odds of Selling Your Seattle-Eastside Home in March, 2010? March, 2010 2923 homes for sale 778 homes sold 27% odds of selling. March, 2009 3711 homes for sale 305 homes sold 8% odds of selling. Home sales were up in all Seattle-Eastside cities, a trend which we’ve seen since the first of the year. Last week, we hit 12,726 properties for sale in King County, exactly 3000 more properties than the first week in January. This week we saw the first significant drop in the number of King County properties for sale as the number dropped by 120 to 12,606. There’s only been one other week this year where the amount of homes for sale dropped and that was only by 8 homes. On Seattle’s eastside the number of homes for sale continues to rise as over 200 more homes came on the market this past month. Home sales on Seattle’s Eastside: up 85%! Best odds of selling: Redmond, near Microsoft, and East Bellevue with the greatest odds of selling. Thirty-four percent of the homes got offers. Worst odds of selling: West Bellevue, with only 18% of the homes getting accepted offers. Biggest increase in sales from last year: The plateau cities of Sammamish and Issaquah, plus Fall City and North Bend, with 154% increase in the number of home sales from last year. Smallest increase in sales from last year: Redmond and Carnation, with an 18% increase in home sales over last year. Decline in real estate sales from last year: None on the eastside. More homes sold in all areas of the eastside this March than compared to March, 2009. The number of eastside homes for sale now: 2923 homes. What have you seen happening in your area? Are real estate sales popping? For The Seattle Times view of the March, 2010 real estate market, check out this link. KPLU had a piece earlier this week about last month’s real estate activity. What’s in store for April? What do you think will happen? I suspect the market will continue to be very strong, particularly in more affordable price ranges. Will our more positive real estate market continue after the April 30th deadline for the home buyer tax credit?